2014 Beltwide HEADs to New orleans - And SO WILL WE! Incorporated officers includes; Chairman–BB Griffin, producer, Lewiston, North Carolina; Vice Chairman– Mark Watte, producer, Tulare, California; Secretary–Dahlen Hancock, producer, Ropesville, Texas; and Treasurer–Bernie Jordan, producer, Yazoo City, Mississippi. These officers will serve a two-year term. The Cotton Board Importer Support Program (ISP), with support from Cotton Incorporated, continues to sponsor scholarship programs designed to give college students majoring in fashion-related disciplines, hands-on experience working with cotton fabrics. These scholarship programs and competitions are held at universities across the nation, including schools here in the Cotton Belt. Last month, students in Mississippi State University's Apparel, Textiles and Merchandising program celebrated the culmination of their current ISP-funded scholarship program. The students studied different aspects of cotton throughout the semester, and even visited the farm of Cotton Incorporated officer Bernie Jordan during this year's harvest. They also held a fashion show to showcase their cotton designs. Although each program is different in strategy, they all aim to familiarize the next generation of fashion designers with the benefits of working with cotton. The FABRICAST™ fabric collection is a series of cotton and cotton-rich fabrics developed by the Product Development Team at Cotton Incorporated. A variety of innovative 100% cotton and cotton-rich blend woven and knit fabrics are developed annually for the apparel and home markets to serve as inspiration for companies that utilize cotton. These cotton fabrics highlight new and interesting yarns, unique weaving and knitting constructions, dyeing and finishing techniques, and fabric performance technologies. This fabric collection is designed to help product developers, manufacturers and retailers get the most from cotton. The knit and woven fabric collections provide new ideas and inspiration for design and development teams each season. The most recent installment of the FABRICAST™ collection focuses on core fabrics with a twist for the athletic market, surface embellishments on denim, textural dobby weaves, ultrafine jersey, complex garment effects, and indigo alternatives. For more information on the FABRICAST™ collection, visit: http://www.cottoninc.com/product/Trends-Fabric/Fabricast/. million) and consumption (+50,000, to 109.7 million) projections for 2013/14 were relatively minor, and the change to the 2012/13 Indian stock figure was the primary driver behind the 692,000 bales increase (from 95.7 million to 96.4 million) in the 2013/14 estimate for global ending stocks. With few changes to supply and demand figures, the same forces that have driven the cotton market over the past two crop years can be expected to continue to influence prices. One such force is the weight of record global ending stocks, which threatens to push prices lower. Another force, which has counteracted some of this negative pressure, is the supportive influence of tighter than average stocks outside of China. 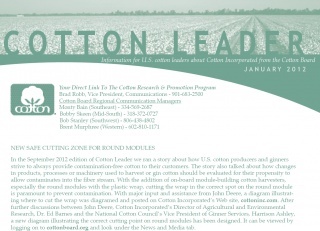 At the center of the cotton market is uncertainty surrounding Chinese cotton policy and Chinese import demand. More aggressive releases from government reserves, which would imply lower levels of Chinese imports, could be expected to pull world prices lower. Conversely, higher Chinese import demand implies lower stocks outside of China and continued support of world cotton prices. On November 28th, China began a new round of auctions selling cotton from reserves. The base price for this auction is the rate of 18,000 RMB/ton (135 cents/lb). Sales are set to continue through the end of August. Unlike the last round of sales, the current auction does not tie access to import quota to purchases from reserves (there was a 3:1 ratio, which allowed one tone of imports for every three tons of cotton bought from reserves). However, as was the case last crop year, an effort to tie access to the international market to reserve purchases could be made at a later date. No news has surfaced regarding the potential volume of import quota that might be released this calendar year, although there was recent announcement regarding a slight increase to the tax rate system applied to cotton fiber imports. If enough import quota is eventually released to cause estimates for Chinese imports to increase from their current levels, there could be some upward pressure on world prices. In the meantime, while we wait to see how much cotton China may imports, the combination of the threat of further releases from reserves weighing on prices from above and potential Chinese import demand outside of the quota system supporting prices from below, world cotton prices could be expected to continue to hover within their recent trading range.